With Spotify hitting 170 million monthly active users this year, there’s little doubt the future of music is online. Local bands can upload their music online on a multitude of platforms including Spotify and expose their music to millions in just an instant. In some cases, bypassing the need for third parties like a record label completely. So how do you take advantage of these platforms and which ones are worth your time? We take a look to help you hit the right note. It’s important to have one platform where you control your music, content and brand image—your website. If a promoter or fan is searching for you online, the first hit they should get is your band website. This is your chance to hook them with a great first impression and win them over with an amazing user experience. Don’t be afraid to blow your own trumpet! Even if you promote your music online elsewhere you should always have a website to list your tour dates, news, contact details and some sneak peeks! If you don’t have a website yet, don’t worry! You can easily create a website with Jimdo below and connect your band’s social media page. What are the advantages? Uploading your music to Spotify has a ton of advantages, the main one being a huge reach. Spotify is used by a worldwide audience with its mobile and desktop downloads. Unknown artists have the chance to shine through the “Discover” tool and “Release radar” that connects similar music. Almost every artist is in the Spotify music library, connecting your name by association with the biggest stars. Many music channels tend to be saturated with artists but Reddit still has a lot of untapped potential for grassroots marketing to promote your music. This is the perfect opportunity to get up and personal with your potential fans and build up your brand. Reddit is interactive and there’s no distance between you and your customer base. 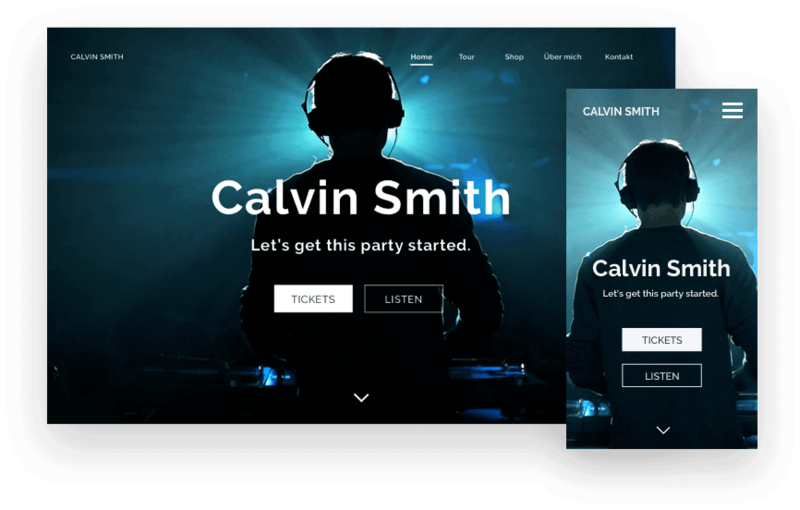 You can introduce yourself, share your website so people can listen to your tracks and interact with your potential user base. Reddit users don’t hold back so be prepared to get some constructive (and unconstructive) feedback about your tunes. Hashtags are huge on Twitter and Instagram but you’ve got to make sure you use the right ones to really see effective results. You should always add hashtags like #music, your music genre e.g. #AcidJazz and your own band/artist hashtag to get started. If you play live, always have your artist/band hashtag displayed clearly at gigs so people can tag you with credits when they post the video on their social media page. Did you know? Artists Justin Bieber and Carly Rae Jepsen were discovered on YouTube! The platform offers a perfect opportunity to organize playlists, showcase your music videos and show backstage antics. The “Browse channels” offers the potential for you to be found in the “Creators on the rise” or “Popular on YouTube” section. Last.fm has some really cool features for aspiring artists. The “scrobbling” feature checks what users are listening to most then streams songs based on the findings. Fans can subscribe to your music and they’ll receive an instant notification if you’ve uploaded a song or given an update. Users often find new music by following people with similar tastes so they get notified about their new favorite song. Musical.ly is a global video community and a favorite of Gary Vaynerchuk. If your music appeals to a younger audience (or tweens) and is video-focused this is a chance to directly target your niche market. Although Musical.ly is only available via mobile app there’s still a lot of potential. The musical.ly market is not as saturated as bigger platforms. There’s an interesting story on EDM.com where an artist tried a three-week Musical.ly campaign for their song and “saw monthly Spotify listeners increase from 86,000 to 902,000.” Now that’s potential! What music platforms work for you? Do you want to promote your music to other Jimdo users? Post your artist/band website in the comments below!